Chelsea was born in St. Petersburg, FL and grew up in the small town of Pennsville, NJ. She has been acting and modeling since the age of 5 in the Tri-State area. She graduated from Rutgers University in New Brunswick, NJ, with a major in Media/Journalism for Broadcasting, a minor in Theater, and concentrations in Music/Dance. 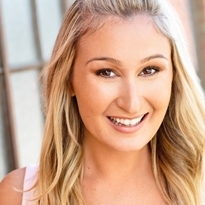 Since moving to Los Angeles, Chelsea recently wrapped up supporting roles on Lifetime in the feature film “Don’t Wake Mommy” with Sara Rue, Dean Geyer and Ashley Bell, and the feature “Uploaded” with Eric Roberts and Tom Green. She is currently working on the feature “Girl Games” with a leading role also starring Eric Roberts and Cary-Hiroyuki Tagawa and recurring as Doctor Barbee on the hit webseries “Barbee Rehab” on Amazon. Chelsea also volunteers doing animal rescue on the side and loves to travel, she has rescued over 20 animals and been to over 40 countries! I am SAG-AFTRA and willing to travel! © 2018 Chelsea O'Toole. All Rights Reserved.